I have mentioned it before, I just want to say it again. 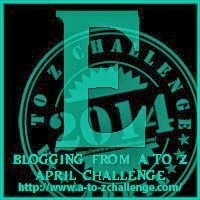 I really enjoy the A to Z Challenge. One of the reasons is everyone is welcome. Even the Adult content folks, they are required to enter "Adult Content" which seems perfectly fair. All others are welcome as well. I wanted to let everyone know, although you and I may disagree on something, you are always welcome to stop by and say hello, check out my posts, or just surf by is fine for me too. I haven't picked a real theme for this year, and I am struggling this first week. However, I will get better and provide plenty of great discussions in the days that remain in the challenge. Kick back, take a look at some of my older posts. Let me know what you think. Enjoy the hoping around checking out different blogs. I know that is one of the great things about the challenge, is you get to see what others are thinking and possibly find some great advice. Have a great weekend and enjoy your one day off. I will see you around. I am also doing the A to Z Challenge and focusing on picture books because I am a children's picture book author. Good luck with the challenge!